Western blotting analysis of human cerebellum (A), Mouse brain (B) and Rat brain (C) lysates (35µg protein in RIPA buffer) probed with Goat anti Human GFAP antibody (AHP1468) at 0.01, 0.3 and 0.01μgml-1 respectively. Primary incubation was 1 hour. Signal was detected by chemiluminescence. Immunohistochemical staining of formalin fixed cryosection of human hypothalamus following antigen retrieval with citrate buffer pH 6.0 at 80°C for 30 min. Sections stained with Goat anti Human GFAP (AHP1468) at 0.01 μgml-1 followed by secondary anti Goat-HRP-staining with Ni-DAB after Biotin-SP-antigoat amplification. Data obtained by Prof. Erik Hrabovszky, Inst, Exp, Med., Budapest, Hungary. 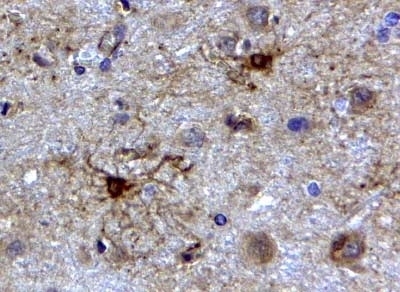 Goat anti Human GFAP antibody recognizes an epitope within the C-terminal (CT) region of human GFAP (glial fibrillary acidic protein), a class III intermediate filament (IF) protein specifically expressed by glial cells or cells of glial origin e.g astrocytes, ependymal cells and Schwann cells. GFAP plays a role in several cellular functions within the central nervous system (CNS), including cell structure and stability, communication, motility and mitosis, and is rapidly synthesized during astrogliosis, following trauma/injury. Mutations in the GFAP gene are responsible for the rare autosomal dominant disorder known as Alexander disease, resulting in the destruction of brain white matter and the formation of fibrous, eosinophilic deposits known as Rosenthal fibers. Characteristics of this disease are associated with transgenes and other mutation types in mouse. Antiserum to human GFAP (CT) was raised by repeated immunisation of goats with highly purified antigen. Purified IgG was prepared from whole serum by affinity chromatography. Peptide sequence C-DGEVIKESKQEHKD from the C-terminal region of GFAP (NP_002046.1). AHP1468 detects a band of approximately 48kDa in mouse brain cell lysates. Gomes, F.C. et al. (1999) Glial fibrillary acidic protein (GFAP): modulation by growth factors and its implication in astrocyte differentiation. Braz J Med Biol Res. 32 (5): 619-31.